The mountain on which the city was built was discovered by members of the Five Hundred Companions of Ysgramor, who discovered the Skyforge, an abandoned forge with the ability to smelt superior Skyforge Steel. The local elves feared the Skyforge as a relic of the gods. Following Ysgamor's death, Harbinger Jeek of the River built the mead hall of Jorrvaskr beside the Skyforge, founding the settlement. This group became the Companions, a famous band of mercenaries. The palace of Dragonsreach was built by Olaf One-Eye to house the captured dragon Numinex. 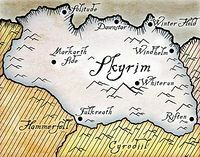 The area used to be referred to as the "Imperial City of Skyrim", before it underwent several acts of chaos, including a dynastic feud, attacks by Hörme bandits and frost trolls, and a series of annihilating winters of alternating floods, droughts, and fires. The young Barenziah escaped to here for a week with a young lover during her return to Mournhold. During the late Third Era, a self-proclaimed priestess of Lorkhan, Jsashe the Witch-Queen, controlled the county and the local witches' coven. In 4E 201, the city was ruled by Jarl Balgruuf the Greater and played a major role in the Dovahkiin's efforts to defeat Alduin. 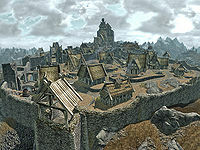 Whiterun was also the site of a major battle in Skyrim's Civil War, in which Stormcloak forces attacked the city, which was defended by the city guard reinforced by Imperial soldiers. Vignar Gray-Mane was backed by the Stormcloaks as a replacement jarl, while the Imperials haltingly supported Balgruuf. The Gildergreen died that same year, but it was restored by Danica Pure-Spring, a priestess of Kynareth.